A popular movie, a few years back, starring Mel Gibson, humorously portrayed a man who, after an electric shock, “miraculously” was able to hear what women thought. Armed with this “mystical” ability, he was able to manipulate the women in his life to do what he wanted. It was a fantasy narrative that showcased what the bestselling book, “Men are from mars, Women from Venus” described more technically – men and women are different with a completely different set of priorities and drives. That same desired fantasy resides today in both the minds and hearts of Christians who are disappointed with one or more males in their life. Many a person wishes they could unlock the mystical ability to push the right button in order to manipulate men into doing what they should, that is, what God wants and what He created them to do and to be. Unfortunately, like the Mel Gibson movie, it’s a fantasy, a sort of madness. Most mature Christians want men to take responsibility for spiritual leadership in the home, as God intended. But expecting that men will automatically do so is naïve and believing we can manipulate them into change through tried and failed methods is a form of madness. And, the specific “madness” is expecting that we can push men into biblically responsible living by prescribing external resources to them; counseling, books, conferences, sermon notes or challenging comments like “if you were more like…, you would get off your rear and lead your family as God intends”. None of these methods of behavior manipulation will work. In fact all they do, actually, is motivate a man to act self protectively! Pushing resources won’t change men, instead it motivates then to evade, to evacuate, to rebel, to counter the “challenge” with some sort of self-serving alternative conjured from a mind that thinks; “I’ll show you who’s boss”. Now I am not saying these things are bad, far from it – they are wonderful. Books, counseling, etc., are outstanding tools, for the compliant learner; who wants to improve his “game”. Yet, for the disappointing male, who is shirking his spiritual leadership at home, these “solutions”, these academic or clinical recommendations and prescriptions, to improve his behavior, won’t work. Why; because the spiritually, passive, apathetic or resistant male, will not walk down that road to improvement. He is intimidated by it, he is afraid of what it will cost him; He sees no pay off in doing what others advise. Think of it, practically for a moment. Do we really think that men, bred from the lineage of Adam are going to be spiritually mature, emotionally sensitive and physically protective to their wives; naturally? Hog wash! You remember the story in the garden where our forefather, Adam, first abdicated his male responsibilities and let his wife lead him into immorality and death (Genesis 2:15-17 and 3:1-24). What you may not have noticed is the seedy side of that story and how it unmasks the ignoble state of men to this day. Think of it, what man would passively stand by and watch someone else seduce his wife into sin and not step in and confront the intruder. Have you ever thought about that; why Adam didn’t step between satan and Eve and say “hey, wait a minute, snake, I am in charge of the decisions here. I know for certain that is forbidden fruit, God told me so, and I am that one who is to transfer spiritual information to my wife so she knows God’s rules for life, not you. So stand down and get back, you are lying to my woman”! Naw, he didn’t do that then and too many men don’t do it now. Therefore, we have a huge problem when it comes to spiritual leadership in the home. I know lots of women who are living with modern day Adam’s. Their husbands are spiritually passive, lack biblical insight and the courage and confidence to use it. They prefer the wife take the spiritual lead and women are all too capable of doing so. Initially, the role capitulation seems to work, for a while. But sooner or later, the women find themselves, their husbands or their children, being confronted by another “suitor” that is seducing them from God’s standards and they feel isolated and impotent to solve the moral slide taking place in their home. The “snake” has won again! Well, I wish it was as simple as getting a man into counseling, giving him a book, taking him to church or asking the pastor to start a men small group, but it isn’t. Even though the gospel is propositional, (Now I make know to you brethren the gospel which I preached to you, which also you received, in which also you stand, by which also you are saved…” 1 Corinthians 15:1,2), it is also demonstrative (“Follow me and I will make you… “ Mk 1:176; “Be Imitators of me as I also am of Christ”… 1 Corinthians 11:1; “the things you have learned and received and heard and seen in me, practice these things; and the God of peace shall be with you…” Philippians 4:9). In other words it isn’t enough to stuff information into a man’s face and expect him to change. Men are too stubborn for that. They fight back – passively or aggressively – but they will push back, nonetheless, to prove that “they are still the boss”. Yea, I know it’s sick but it is what it is. Therefore, I suggest two things. 1. Pray. The fact is you can’t change anyone. In fact, if you are like me, you spend a lot of your time, and much of that ineffectively, trying to change yourself. No, you can’ change anyone, only God can. So go over a man’s head to God. He can break a man sufficient to get him “in line”. Therefore, sometimes the best thing for a wife, sister, mother or friend to say, is nothing. Listen to the Apostle Paul’s advice – “wives… to your husbands…if any of them are disobedient to the word (the propositional part) they may be won without a word by the behavior of their wives “(the demonstrational part) 1 Peter 3:1. 2. Another man. Solomon gave us wise advice when he described the need for “like” material to hone another. He wrote; “Iron sharpens Iron, so one man sharpens another” Proverbs 27:17. It is so simple but easily overlooked; especially in a generation celebrating absolute equality, tolerance and the absence of distinctions – including gender. A woman cannot sharpen a man, not any more than glass, plastic, wood or bubble gum can sharpen steel. If you have ever sharpened a knife, you know that it takes hard steel to eliminate the dull edge and bring a sharp, polished edge to the fore. In order to sharpen a dull man he needs to be engaged with better men, sharp men, who will give him the demonstrational challenge that will peel the “baby” off his manhood and create a productive energy to “compete”, to stand alongside his peers as one of them, better than he started. The fact is good men motivate mediocre men to higher standards of behavior. Now, how will you get a man into such a relationship or such a group? Well, again, that is why #1 is so important – you need God to do it. You need God to prepare him for such an engagement, God to bring along the “demonstrational” good man, God to move your man into that space to develop a constructive, spiritually engaging, growing relationship. And the good news is there are plenty of those men still around, you just need God to intersect them with your man; be he your son, husband, brother or friend. 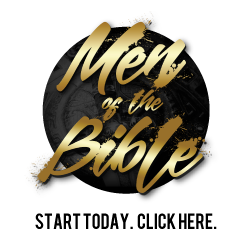 BTW: this is what The Master’s Men Ministry seeks to do, we seek to engage Christian men, by forming a men’s team around them, so that they can reach out to other men with the gospel of proposition as well as demonstration; lifting up Jesus, so that He will draw all men to Himself. And He still does so today through men, inviting other men to “follow Him” (John 3:14, 15; John 12:32). Therefore, if we can help you with #2, let us know.